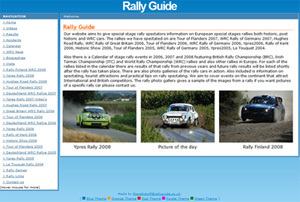 Rally Guide aims to give special stage rally spectators information on European special stages rallies both historic, post historic and WRC cars. 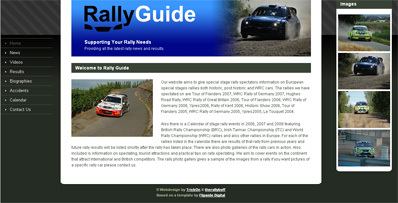 The website has many picture and video galleries, also included is a news section and a calendar/result section to ensure fans are kept fully up to date. 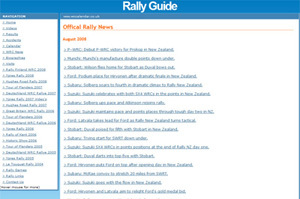 WRC news covers all of the lastest press releases and news from the WRC Teams, Drivers and Organisers. 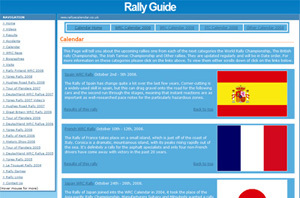 Rallye Calendar gives all of the dates for the WRC, BRC and ITC Championships, with each rally listed is a small summary about each rally, the results from previous year's rallies are also provided. 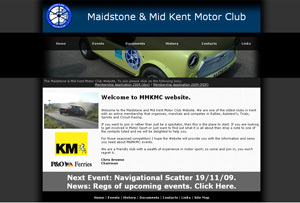 MMKMC is one of the oldest clubs in Kent with an active membership that organises, marshals and competes in Rallies, Autotest�s, Trials, Sprints and Circuit Racing. If you want to join in rather than just be a spectator, then this is the place to start. If you are looking to get involved in Motor Sport or just want to find out what it is all about then drop a note to one of the contacts listed and we will be delighted to help you. 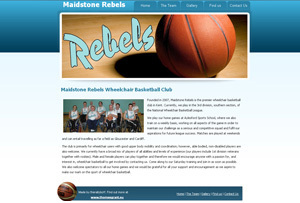 The club is primarily for wheelchair users with good upper body mobility and coordination; however, able bodied, non-disabled players are also welcome. We currently have a broad mix of players of all abilities and levels of experience (our players include 1st division veterans together with rookies). 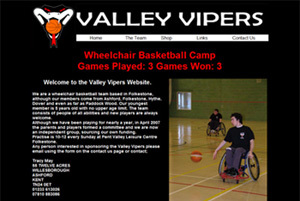 Valley Vipers is wheelchair basketball team based in Folkestone, although the members come from Ashford, Folkestone, Hythe, Dover and even as far as Paddock Wood. Our youngest member is 5 years old with no upper age limit. The team consists of people of all abilities and new players are always welcome. 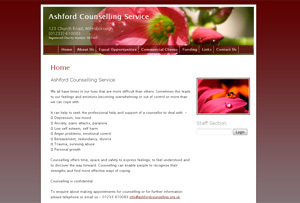 The Ashford Counselling Service was set up in 1987 as part of a collective plan to make available high quality and affordable counselling to people in the area. 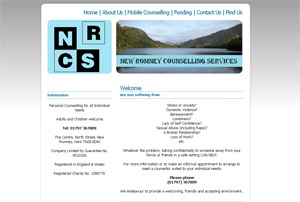 Ashford Counselling Service is a registered charity, and the constitution dictates the requirement of a Board of Trustees who are responsible for policy decisions, and legal and financial responsibility for the service. 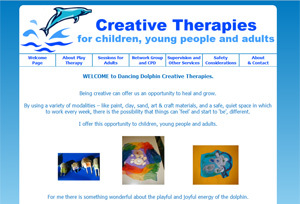 The Dancing Dolphin Creative Therapies is run by Lindsay Thompson who originally trained as a teacher in the 70�s and worked in primary, secondary and special designation schools for 20 years. During that time I completed a BA in Psychology and Sociology and later a Master�s at Kent University. 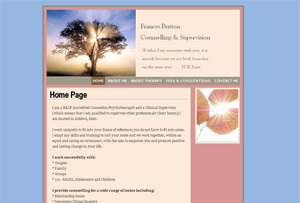 Frances Button is a BACP Accredited Counsellor/Psychotherapist and a Clinical Supervisor (which means that she is a qualified to supervise other professionals' client hours); she is located in Ashford, Kent. 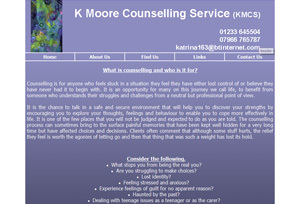 K.Moore counselling services gives a comprehensive professional service offering continuous support to people during times of personal challenge. Each counsellor is a registered member of the British Association of Counsellors and Psychotherapists, and sustains their code of ethics. 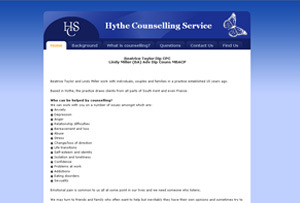 Hythe Counselling Services work with individuals, couples and families in a practice which Beatrice established nearly 15 years ago. Based in Hythe, the practice draws clients from all parts of South Kent and even France. Herbies Antiques is a small firm specialising in old fireplaces and antique refurbishments. 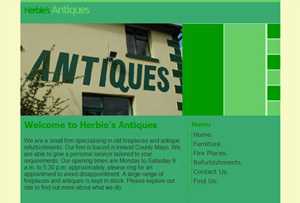 Herbies Antiques is baced in Ireland County Mayo. They are able to give a personal service tailored to your requirements. A large range of fireplaces and antiques is kept in stock. 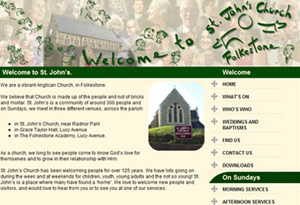 St. John�s Church has been welcoming people for over 125 years. The church has lots going on during the week and at weekends for children, youth, young adults and the not so young! St. John�s is a place where many have found a �home�. The church loves to welcome new people and visitors, and would love to hear from you or to see you at one of our services.